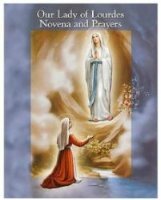 DIVINE CHRISTIAN GIFTS - Lourdes Novena & Prayer Book. Lourdes Novena & Prayer Book. Small booklet -Depicting the apparitions and novena to Our Lady of Lourdes with prayers.